For the month of April, Capalaba Park and Retail First Shopping Centres are partnering with Share the Dignity to run a donation drive for the collection of tampons, pads and personal hygiene products. There are over 100,000 Australian women and teenage girls who every month go without female sanitary products because they cannot afford them, due to homelessness, poverty and domestic violence. This initiative aims to provide the basic essentials for women and girls in crisis, and alleviate the undignified situations that thousands experience across the country. 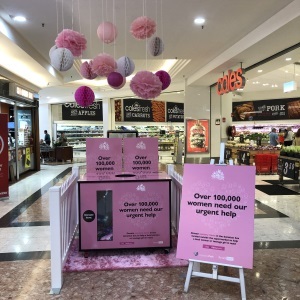 Next time you are at Capalaba Park, pick up an extra sanitary item or two and place it in the pink donation box located between Coles and Flight Centre (right). Visit https://www.sharethedignity.com.au/ for more details on Share the Dignity. SHARE THE DIGNITY: Watch the video below to find out how Share the Dignity founder, Rochelle Courtenay started the initiative.